I am such a lucky girl. Yesterday I received a present for my lovely blog friend Darlene at “My Life for a Year”. 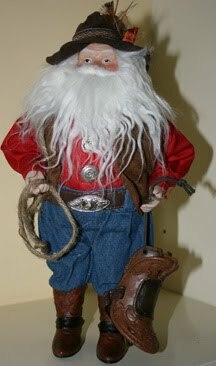 Darlene lives in Canada and last Christmas she read my post about how I like to collect Santas for my Christmas display. Way back in January she told me she was sending me a gift but I had no idea what it was. I think we had both almost given up hope that it was ever going to arrive then yesterday the lovely Australia Post delivery man arrived at my door with a parcel for me. I didn’t even think of Darlenes present, I just thought I had ordered something online and forgotten about it. When I got it open (Darlene I bet you had to go buy a new roll of sticky tape after sending it) I was so excited and happy to have received my elusive gift. Thank you Darlene for my gorgeous “Red Neck Santa” I just love him. I think I might just leave him on show until Christmas he makes me smile way too much to be put in a cupboard for the next eight months. “Davine Time” update: For Christmas my beautiful daughter Rachel gave me a gift voucher for a massage. So today I took myself of to have a Reflexology Massage on my feet. It was so so nice and very interesting as the parts that hurt were where the Sciatic Nerve is radiated to and I always have problems with my Sciatic Nerve. I did also actually do some work today, but it was some very enjoyable creative work. 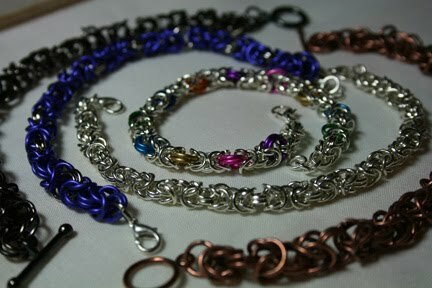 I made these bracelets. I love the bracelets Davine, so pretty. A massage, oh what I'd do for one of them right about now! I'm glad that this Santa finally found you, he sure took his sweet time getting to you, he sure is cute! Santa is more than just a keeper he's a stunner too. Your bracelets are wonderful, you have such a good eye and do lovely work. Hello Davine, Just love your present. Definitely too good to put away. You certainly are very creative. Beautiful braclets. Being pampered, even if its the feet, bliss!